Fulvic acid is one of nature’s most useful byproducts. Found in the nutritious layers of the earth, fulvic acid upon the death of animals and plant life in small amounts by the action of millions of tiny microbes working on the decaying matter. Fulvic acid activates the nutrients found in the soil allowing them to be utilized by plant cells. Fulvic acid has a similarly beneficial effect in humans and can serve as a vehicle to better carry nutrients to the correct parts of the body. It is considered so effective that it can carry over 60 minerals and other trace elements and transport them directly into the cells. Fulvic acid is considered by many to be the ultimate nutrition booster as it helps the body to absorb not only minerals and vitamins but also probiotics, fatty acids and antioxidants. Because of this it is considered to be a very effective weapon against aging and many chronic diseases. Fulvic acid contains a range of nutrients that help improve and retain excellent intestinal health. These nutrients include trace minerals, fatty acids, electrolytes, probiotics and prebiotics. These nutrients all help to nourish the digestive system and also boost its ability to populate itself with healthy bacteria or microflora. A strong digestive system is linked with improved immunity, stress reduction and appetite control as well as general digestive health. There is evidence that fulvic acid can help reduce the risk of many digestive conditions including SIBO, IBS and leaky gut syndrome while its ability to improve the immune system can keep many illnesses at bay from common colds to more serious conditions. Getting sufficient trace minerals and electrolytes is vital for many bodily systems including digestive health and metabolic function. Fulvic acid provides the body with the ability to improve the gut’s ratio of good bacteria which in turn helps reduce symptoms of poor digestion such as diarrhea, constipation, bloating and allergies to food. While fulvic acid contains many important nutrients in its own right, it also helps absorption and transport of minerals and nutrients to the cells. It helps make the cells permeable and can also fight inflammation in the digestive tract. Fulvic acid has natural antioxidant properties which give it the potential to protect against degenerative cognitive conditions like Alzheimer’s disease. As well as contributing to cognitive decline, free radicals which we encounter on a daily basis contribute to aging and many serious diseases. There is no way of avoiding exposure to free radicals completely which is why it is important to get as many natural antioxidants into our bodies as possible. Antioxidants can reverse the damage inflicted by these free radicals and reduce the risk of disease. The antioxidant properties of fulvic acid makes it important for cellular health and also to detoxify the body’s organs and tissues from toxins and heavy metals. Fulvic acid and other humic acids are effective because they can bind with toxins and heavy metals and break them down whether they have entered the body via the water, food, air or household products. There is some evidence that fulvic acid can help to heal wounds, rashes and infections of the skin. Fulvic acid has the potential to treat insect bites, minor wounds, scrapes and rashes and may even be useful in treating skin conditions like eczema. This research supports some of the traditional uses of fulvic acid as a remedy for rashes caused by poison ivy, insect bites and fungal infections such as athlete’s foot. There is evidence to suggest that fulvic acid has potent fungicidal properties making it an excellent treatment for athlete’s foot and stubborn toenail fungus. People who supplement with fulvic acid have reported that their energy levels have increased. This is likely a result of detoxification, reduced inflammation and increased intake of important nutrients. Research undertaken by Doctors across- borders found that because they are natural electrolytes, humic acids like fulvic acid helped energize and activate many of the body’s biological processes. There is evidence that as an electrolyte, fulvic acid can help reduce inflammation, improve circulation and soothe painful muscles. It may be a useful treatment for many painful conditions related to inflammation such as arthritis, headaches and muscle pain as well as nerve pain. Although it is naturally occurring in the soil, foods do not contribute a great deal of fulvic acid to the diet. This is mainly because of the increasing use of pesticides, fertilizers and mineral depletion of the soil. 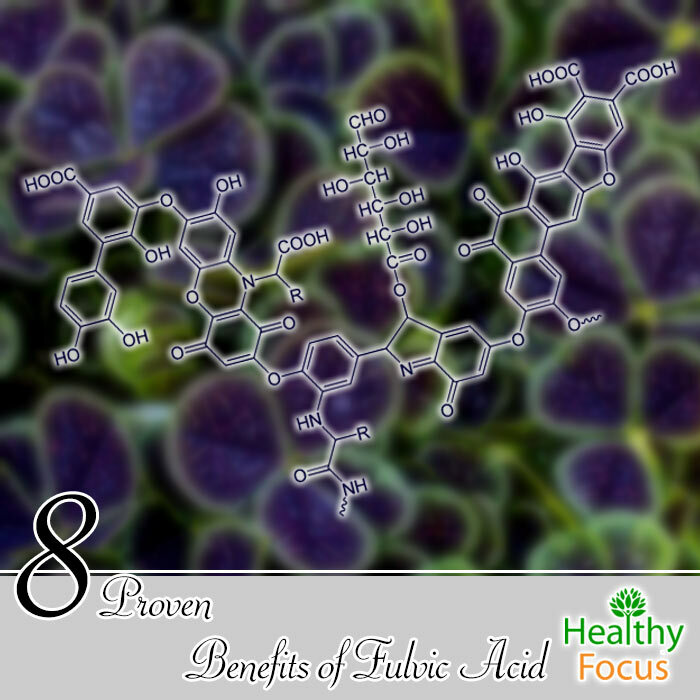 As a result, you may want to consider adding a fulvic acid supplement to your daily routine. Fulvic acid supplements are available in several forms including liquid and solid forms. Fulvic acid is believed to be more bio-available if it is taken in liquid form or ‘fulvic acid water’. Experts believe that when it is consumed as a liquid, it enters into the cells more effectively as opposed to solid forms which the digestive system needs to break down before the cells can utilize the nutrients. Follow the dosage recommendations carefully but most liquid fulvic acid products are in the form of extracts and you typically use around 12 drops mixed into 16 ounces of water. Solid supplements do not taste very nice and many people mix the powdered form into juices and smoothies to make it more palatable. Fulvic acid supplements are generally believed to be safe for the vast majority of people but evidence is lacking regarding any potentially adverse effects on pregnant women and other special groups. If you are concerned, make sure that you speak to your doctor before taking it. Because it is 100% natural and easily flushed out of the system, experts do not think it is possible to overdose on fulvic acid. The few reported side effects have occurred when people have taken very large amounts of pure fulvic acid. Experts recommend starting off slowly and building up your intake in gradual increments. It is also better to dilute it with water or juice than consuming it neat. People with immune disorders should only take fulvic acid under medical supervision because it may stimulate the immune system leading to further complications. There is insufficient evidence regarding its safety for nursing mothers and it is best to stay on the safe side and avoid it until more is known.